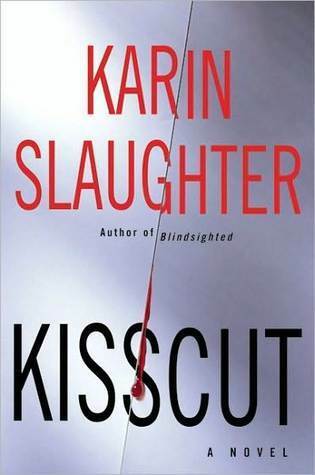 Kisscut is the second book in the Grant County series written by Karin Slaughter. It’s Saturday night, and in the small town of Heartsdale, Sara Linton, the communities’ paediatrician and medical examiner, is spending the night out at Skatie’s, the local skating rink. The rink is the Saturday night hotspot for local teens, many of whom are known to Sara from her role as their doctor. The night comes to an abrupt end when a heated argument between two of the teens leads to a fatal shooting. As the town’s medical examiner, Sara finds herself embroiled in the investigation with police chief, and ex-husband, Jeffrey Tolliver. When the autopsy reveals terrible signs of abuse and mutilation they find that the friends of the victim all close ranks, and their families don’t want to talk to the police. It has been many years since I read the first book in the series, and I have to admit that I’d forgotten the relationships between all of the main characters. However, this didn’t really matter, as the book contained enough backstory and historical information to ensure it also worked as a standalone novel. A problem I had was that I felt at times the story got a bit bogged down with character development. This led to some of the chapters becoming overlong, and in some cases irrelevant to the story in my opinion. This may be because I like books with short sharp chapters that keep the story moving at pace. I also found it hard to like some of the characters at times. Sometimes their actions became really frustrating, if not bewildering to me. I couldn’t quite work out why on several occasions, a seemingly sensible person would make a particularly rash decision - or maybe the reason was completely lost on me - but more likely it had been contrived and used as a plot device to move the story along. I have to say that I didn’t really enjoy reading the majority of Kisscut, however, it did have some redeeming features, so it wasn’t a complete waste of time. Unfortunately, while the story worked, and there weren’t any gaping plot holes, by the end I didn’t feel like I got any payoff for investing my time in reading the book, which was the biggest shame.